Petula Clark has been in the entertainment business an amazing sixty years, has recorded in excess of 1,000 songs, sold more than 70 million records, appeared in over thirty films on both sides of the Atlantic as well as gracing the musical stage both here in the UK and in the States. 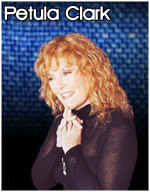 Petula Clark is one of Britain's most successful solo performers of the 20th century. She has been a massive star since World War II when she began her career at the age of eight, as a child entertainer for the British troops, on stage, screen, TV, radio and in the charts. Her career has involved acting, recording, playwriting and songwriting. She has sung critically acclaimed theatrical performances to sell out concerts around the world, and has made brand new recordings in the 21st century that are among the best of her career. She was the first British female artist to receive a US Grammy with 'Downtown' in 1965, which made her the first British female singer since Vera Lynn to top the US singles charts, and then again with 'I Know A Place'. Both Grammies were for best rock 'n' roll records of the year. She was subsequently the first British female singer to top the American charts twice with 'Downtown', & 'My Love', and the first ever female singer to hit the US Top 3 with her first and second hits ('Downtown' and 'I Know A Place'). Some of Petula's other hit records include "I Couldn't Live Without You", "Colour My World",and "This Is My Song". On TV, Petula has hosted several award-winning variety series in the UK and three US TV specials. During an NBC special in '68 she made a stand for racial equality when she touched Harry Belafonte during a song and wouldn't let the network cut it. On stage, Petula has won several awards. In London, she acted in The Sound Of Music and her own Someone Like You (co written with Dee Shipman and Fay Weldon) in the 80s. In the 90s, she starred on Broadway in Blood Brothers, and Andrew Lloyd Webber's hit musical, Sunset Boulevard as Norma Desmond, which successfully toured the States.